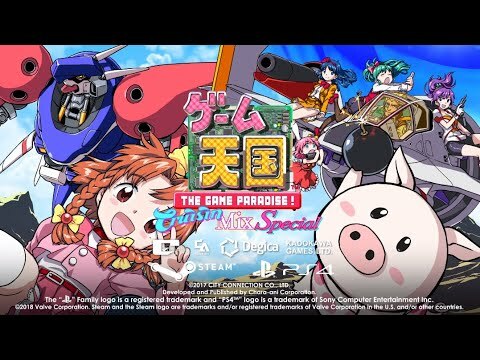 Game Tengoku CrusinMix is a vertically scrolling shooting game mixing cute characters, a game world parodying a wide range of gaming tropes and history, tight controls, refined mechanics and eggplants?! Game Tengoku CruisinMix Special is an enhanced port of Jaleco's classic 90s vertically scrolling shooting game, mixing cute characters, a game world parodying a wide range of gaming tropes and history, tight controls, refined mechanics and eggplants?! CruisinMix features both the console original and the exclusive Arcade Mode + in a retro game fan's dream combination. The self-proclaimed “Super Duper Genius Smart Guy” Yamada has a plan to take over the gaming world; the obvious first step being to take control of all the arcade cabinets at the “You&Me Kamiyoga” arcade in Kamiyoga, Tokyo! But part-time arcade employee Yui Ito is ready to take him on! Determined to put an end to this cunning plot before the arcade opens, she hastily hacks together all the used arcade circuit boards she has lying around and calls upon all the main characters to take down this evil genius! Choose from 6 ships, each with their own unique weapon system and bomb and take the fight to the deranged Genius Yamada and his game-world spawned minions in multiple action and laughter-packed stages. With a cast coming straight from Jaleco's back-catalog and stages based around themes such as JRPGs, Japanese arcades and crane games there's never a dull moment. And don't forget the eggplants!In addition to the Classic console game modes, there's also Arcade Mode+; a refined arcade port with more characters via DLC, and HD Data Mode, with hi-res game flyers, straight from Jaleco's archives! Following its popularity in arcades upon its 1995 release, Game Tengoku hit the home console market in 1997. Featuring classic Jaleco characters alongside original ones all voiced by a number of popular voice actors & actresses; it was a character-based shoot ‘em up that was well ahead of its time!Well-known manga artist Tatsuya Souma provided character designs, there were fully-voiced skits, 4 original songs, and animated sequences too! And all while making other shooting games jealous of how well it pulled off its game mechanics! It managed to be a character-centric game without succumbing to any of the cut corners that usually come with such a title. © 2017 CITY CONNECTION CO., LTD.